Hello CrypoSicko's, it is Sunday and that means we are at the start of a new week. The whitelist has been updated and posted below. 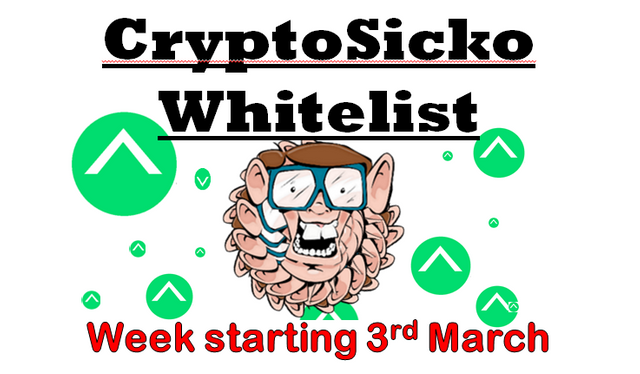 The story continues and CryptoSicko and growing stronger everyday, this week we have had a few members upping delegation's and some new CSB members also. I love seeing members upping delegations more than a new member because it shows me im on the right road and the keep doing what im doing. It's let's me know it's working and members are happy with the CryptoSicko service. There are other bots out there that offer the same service as CryptoSicko but hover up all the post payouts, curation rewards and vote swap for personal gain. CryptoSicko's owner only cares about increasing the max upvote which requires using all monies made from posts, curation, CSB bundles sales and sometimes personal monies for leasing extra STEEM POWER. The bot voting SP is currently 23,700 which is made me of 10,600 from bot operator and 13,100 from delegating members. I hope to hold this ratio of around 2/5 so when CryptoSicko has 100k SP, 40k SP would come from the operator through leases paid from by curation and post payouts and 60k SP from delegating members. This target also keeps CryptoSicko's ROI is a range of 140-160%. So you can see i run alot of number through my mind because i have many idea's but i enjoy running numbers and finding ways to increase everyone's upvote. Thanks for checking out the post, if you are interested in getting daily upvotes from an upcoming bot delegation service, check out the rest of the post. This week we have 30 delegating members and 11 members on CSB bundles. This shows as 13300 SP from delegating members and 2900SP coming from CSB bundles. We have a lease of 5000SP and the CryptoSicko bot is using 2619 of its own SP giving us a total voting SP of 23.819 and a max upvote of 0.58 STU. Currently each member is receiving x15 a self vote on delegated SP which is very competitive in terms of ROI but i would like it to be higher. That figure of 47.03% on the table is to show how much extra you receive with CryptoSicko compared a normal delegation bot that upvotes at x10 self vote. 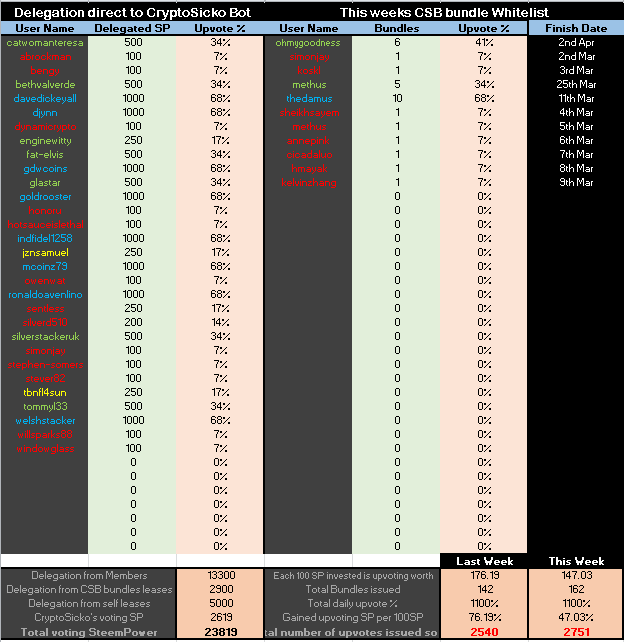 This means that for every 100 SP you delegate to CryptoSicko, you get upvotes worth 147.03 SP. Now is a great time to just go for it and take the first steps into he world of delegating with great returns. The project is to build a new type of bot. A bot that does not require you to send STEEM/SBD everytime you want to use it, a bot that will let you unlock your STEEM POWER into upvotes and a bot that will auto vote your posts every single day. My aim to provide users with an upvote that would be much greater than normal self-voting. When you self vote your own post at 100%, you are using 1 of your daily 10 max upvotes. I aim to provide an upvote that is closer to 9ish upvotes added together. The great thing about it is you are always in full control of your STEEM POWER as it is delegated giving you the complete freedom to join and quit at will. The bot itself is setup on its own server and can be configured to upvote a whitelist of users. The aim is to provide a daily upvote with each user a getting personal set timer that counts down 22 hours from when they last received an upvote from @steemcryptosicko. The bot can be configured to upvote different users different percentage's based on their delegation to CryptoSicko Bot and will be changed on a weekly basis every Sunday. CryptoSicko Bot is no autovoter are even close. She is an amazing piece of kit and she is programmed to provide an equal service to all users weather they have 100 SP are 1000 SP delegated.